This entry was posted in Toronto Trust Cemeteries FSI and tagged James Crawford, Margaret Henderson, Toronto Necropolis by Jane E. MacNamara. Bookmark the permalink. In the Ontario death record, is it possible that “Island” was a mistranscription from notes or a mishearing of “Ireland”? Not a solution, but a possible simplification of the problem. You may be right. If the first word starts with an “i” (mistaken for j) might it read “Inskil”? Inskil, Ireland bears some resemblance to Enniskillen, Ireland from the gravemarker. I retract my previous comment. I just looked up Enniskillen and lo and behold it’s known as the “Island County Town of Fermanagh”. Here’s a link to a map that shows the island. So the Ontario death record may well have been an abbreviated form of “Enniskillen Island”. That said, I can’t see anything that helps with the Necropolis register. 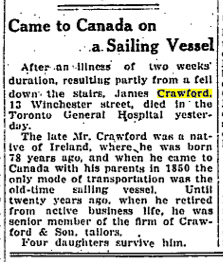 I know a bit about County Fermanagh where it seems James Crawford was from. Unfortunately, he left Ireland before Griffith’s Valuation took place in that county so it won’t be possible to identify any Crawfords related to him who stayed in Ireland. However, I do know that there are two large lakes in County Fermanagh; Enniskillen is between the two lakes. There are many islands in both lakes, especially Lower Lough Erne. I looked at the parishes and townlands in the county that might be where James Crawford was from. One that I think is possible is the parish of Inishmacsaint. Inish can be written as “Inis” or “Inch”. (“Inish” is the Gaelic word for “island”.) Within the parish of Inishmacsaint, there is a townland called “Island”. Maybe James was born in the townland of Island, in the parish of Inishmacsaint? Regarding the “Enniskillen, Ireland” on the gravestone, it could be his family (probably his children) thought that place name would be more recognizable than Inishmacsaint. Thanks for your ideas, Jean.